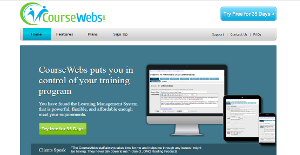 CourseWebs is a fully-featured, flexible, and powerful LMS (Learning Management System) that includes modules such as assessment, content management, enrollment, reporting, e-commerce and more. The affordable software has been designed for a variety of businesses and NGOs, including education providers, colleges, schools, safety programs, sales trainers, medical groups and hospitals, driver training institutes, ministries, product trainers and more. Features such as the online assessment system, content authoring and management, eCommerce shopping cart, registration API provide businesses with all the tools they need to effectively and efficiently manage their learning programs. Depending on organizational requirements and budget, the software can be delivered in multiple ways, including as SaaS (Software as a Service), perpetual site license for datacenter, dedicated servers as well as source code licenses. CourseWebs offers powerful features and flexible implementation plans without making it difficult for users to operate the system. The user friendly and intuitive interface makes it easier for both instructors and students to quickly build a course. Being mobile-friendly, the LMS can be accessed through a browser using a variety of devices, including smartphones and tablets. Customization options allow businesses to brand their LMS, establish business rules and customize the training experience. The publisher also provides custom features, which help meet specific business requirements. The software allows instructors to easily and quickly create online classrooms with quizzes, exams, discussion forums and more, while modifying content is also just a few clicks away using the Control Panel. Support for multimedia files such as Flash and videos as well as PDF and PowerPoint presentations make the learning experience better and more effective. The system has been designed keeping non-technical users in mind and does not require any programming skills to get started. The self-registration shopping cart allows accepting payments for exams from merchant accounts or PayPal. The software also supports various content management systems, including Adobe Captivate, Articulate Storyline and SCORM compatible tools. The assessment system allows including MCQs, true/false questions, short answers, checkbox answers and subjective type essays, and automatically grades answers (except essays). Instructors have the option to make exams timed or untimed, while the system is able to create exams automatically by selecting questions from the database. Automatically graded exams provide instant results to students, which are sent via email. Students also get the feedback for each question if instructors provide it while reviewing the exam. Organizations have diverse wants and requirements and no software solution can be just right in such a scenario. It is useless to try to find an ideal off-the-shelf software product that fulfills all your business requirements. The wise thing to do would be to customize the system for your specific needs, employee skill levels, finances, and other aspects. For these reasons, do not hasten and invest in well-publicized leading systems. Though these may be widely used, they may not be the ideal fit for your specific wants. Do your homework, look into each short-listed application in detail, read a few CourseWebs reviews, speak to the seller for explanations, and finally select the application that offers what you require. How Much Does CourseWebs Cost? We realize that when you make a decision to buy Learning Management System - LMS it’s important not only to see how experts evaluate it in their reviews, but also to find out if the real people and companies that buy it are actually satisfied with the product. That’s why we’ve created our behavior-based Customer Satisfaction Algorithm™ that gathers customer reviews, comments and CourseWebs reviews across a wide range of social media sites. The data is then presented in an easy to digest form showing how many people had positive and negative experience with CourseWebs. With that information at hand you should be equipped to make an informed buying decision that you won’t regret. What are CourseWebs pricing details? What integrations are available for CourseWebs? If you need more information about CourseWebs or you simply have a question let us know what you need and we’ll forward your request directly to the vendor.